Did you know there are actually right and wrong ways to clean glass? 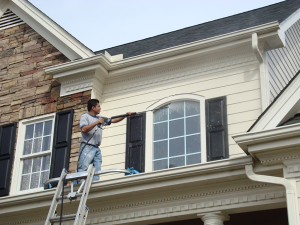 In fact, cleaning your windows properly is more complicated than you might think. It is important to use environmentally safe window washing products that remove outdoor dirt, pollen, bird, and bug residue while repelling water, dirt, and grime to keep your windows cleaner for a longer period of time. Safe and Effective Cleaning Expertise for Clients in Cary, NC. We only use soft cloth scrubbers, rubber squeegees, and microfiber towels to clean your windows effectively. Not only do we clean glass, but our complete window cleaning service includes the frames and window sills as well. We always wear shoe coverings while we are working indoors and move furniture when necessary to protect your belongings. We also understand the importance of being aware of plants and landscaping in areas around outside windows. Finally, we have the all of the necessary equipment and expertise for getting to those hard-to-reach places and properly cleaning all special types of glass. Call us today at 919-678-9019 to schedule your on-site assessment and to receive a free estimate! 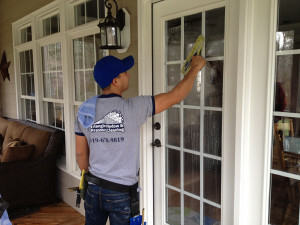 All of Triangle Window & Pressure Cleaning’s personnel are fully trained, insured, and bonded. Our owner visits every job site to ensure our quality and service standards are always upheld. Everyone on the team knows how important it is to do a great job for our customers every time, and to make sure we always exceed our customers’ expectations, we never lose sight of our 100% Satisfaction Guarantee.